Girl's World by Jennifer Paganelli, hardcover book, color, 176 p.
NOW AVAILABLE! Order your copy today, personally signed by Jennifer! Limited quantity of signed editions. 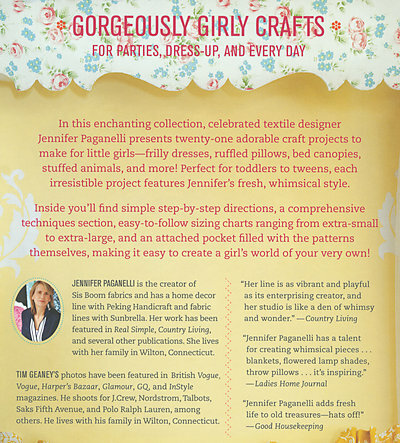 In this enchanting collection, celebrated designer Jennifer Paganelli presents twenty-one adorable sewing projects to make for little girls—frilly dresses, ruffled pillows, bed canopies, stuffed animals, and more! Each project features Jennifer's fresh, feminine flair in sizes and styles perfect for toddlers to tweens. With step-by-step instructions, a comprehensive techniques section, and simple sizing charts ranging from extra-small to extra-large, this book is exceptionally easy to use. Featuring whimsical design, lush color photos, a ribbon closure, and a vellum pocket filled with pattern sheets, Girl's World makes sewing girly goodies a joy for crafters of all levels.